Wes Anderson did it with Bottle Rocket, and it’s since become a classic indie scenario: you shoot the short in order to get funding for the feature. Turns out White House producer Scott Sforza’s latest short was Friday’s George W. Bush Does Too Like Black People, See?. 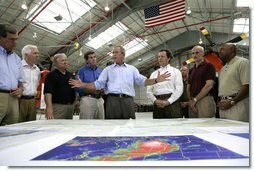 German television crews reported that Potemkin food & aid distribution centers Bush visited were dismantled and abandoned soon after the mediapack following Bush moved on. And LA Senator Landrieu reported that Friday’s hive of emergency repair activity at the 17th St. levee was gone the next day. But it tested well, and with the studio in desperate need of a hit, Sforza got the greenlight to make the feature–it’s more accurate to call it a mini-series, since it goes on all week, beginning yesterday. The cast includes all the usual suspects [sic], plus the biggest, blackest Republican they could find, Condoleeza Rice, who replaces little known HUD Secretary Alphonso Jackson, who originated the role in the short [above]. Karl Rove and Dan Bartlett are writing the script.